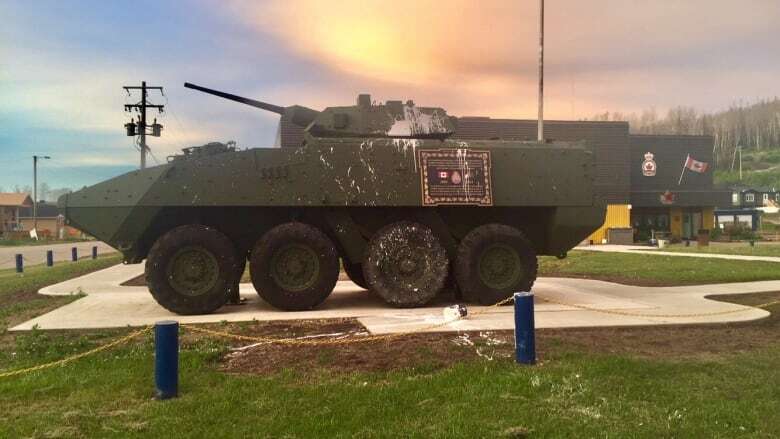 A light armoured vehicle that sits outside the Fort McMurray Legion in commemoration of the 162 Canadians killed in Afghanistan was vandalized Monday. The defacing of a light armoured vehicle that commemorates the 162 Canadians killed in Afghanistan is "a cowardly act," says the president of the Fort McMurray Legion. "It's someone trying to get attention for whatever reason," said Pat Duggan. "If they have an issue with the legion by all means, they can take it up with us." Between midnight and 4.40 a.m., white paint was splashed on the LAV III. Bosnian veteran and legion service officer Ryan Pitchers called the vandalism "a desecration of a grave." "We put up memorials. We have cenotaphs. We have different monuments ... to recognize the service or to recognize the sacrifice that someone has done and that is exactly what this unit is. "It is a representation of the loss of life." Canadians served in Afghanistan from 2001-2014 after the 9/11 terror attacks in the United States. Over 40,000 Canadian Armed Forces served in the international coalition to defeat al-Qaeda and the Taliban. The Fort McMurray Legion dedicated the LAV III monument in October 2017. The 16-tonne vehicle was constructed from previously used parts which have been decommissioned. Most of the paint has since been removed and the incident was reported to police.